Drip Feed Oilers: Lubrite Industries an ISO Certified Company in Phagwara, Punjab is an exclusive Manufacturer, Supplier and Exporter of Drip Feed Oilers from India. 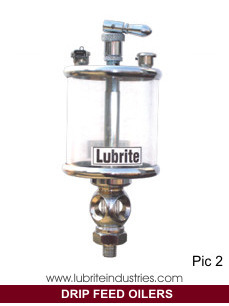 Lubrite Industries is an exclusive manufacturer, supplier and exporters of Drip Feed Oilers from India. Drip Feed Oiler is a commonly used method for automatic oil lubrication. Lubrite Industries has a team of professionally qualified and highly experienced team to efficiently manufacture top quality range of Drip Feed Oilers as per the standard specifications and as per the requirements of a client. Our deep knowledge and expertise in manufacturing such products range dates back to early 1970's. - Drip Feed Oilers are single point lubricators and are mounted directly on lubrication points. 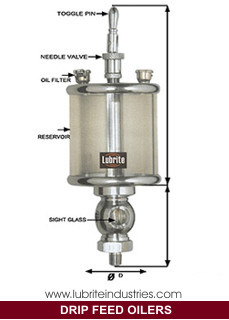 - Drip Feed Oilers dispense oil by gravity from a transparent reservoir through needle valve. - The needle valve is joined with toggle pin by which the operator can on/off the flow manually. - The flow of the oil through the Drip Feed Oiler is controlled by adjusting the needle valve and can be visualized from the inbuilt sight glass. - Drip Feed Oilers are available in different thread size from 1/8" BSP to 3/8" BSP.